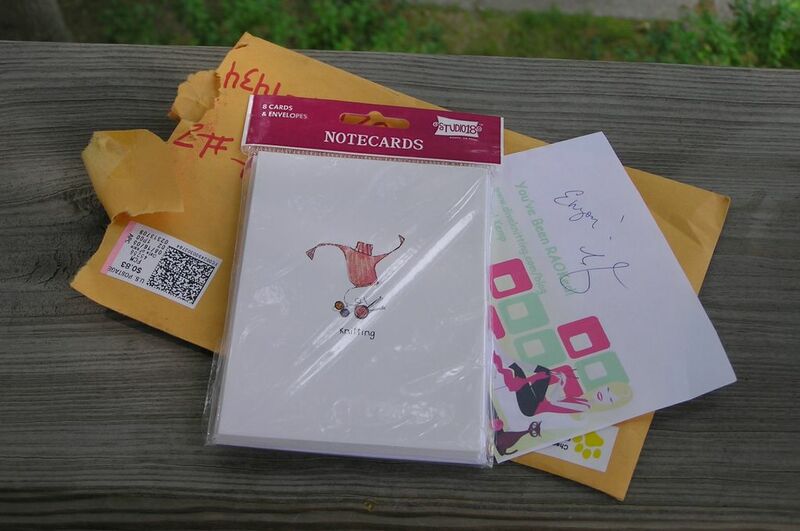 And, look what surprised me in the mail yesterday! Wow! A fantastic little RAOK from Cheryl at Diva Knitting! I love the new notecards and am sure they will come in handy in the near future :). So, thank you Cheryl.. you made my day! And last but not least, the new pattern and yarn I ordered came in the mail from Morehouse Farm! I can't wait to start knitting this little camisole since I think it will be great for the early fall. I told myself I can start this once I get the baby blanket done (mind you, I finished all the squares yesterday). So, just some seaming (yeah right, just SOME) and I'll be having a block party! Lovin' the yarn! So, how does one go about acquiring some of your fabu dyed yarn? Do tell! Super job on the dying, both color and placement. And that cami looks like a fun knit too! Wow, I love how the Gryffindor swatch turned out! Now I think I definitely need some Gryffindor socks - when I can actually reveal myself to you, I'll have to order some up! LOVE gryffindor! 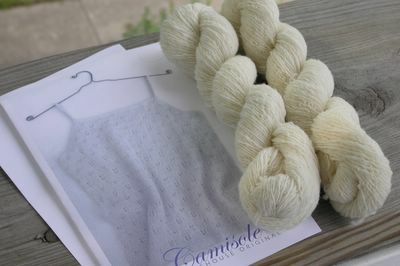 and, the yarn for the lace cami is so pretty. can't wait to see your progress!!! You did a really good job on the dying, you're gonna have matching Socks and Scarf ! I can't wait to see your blancket, good luck on the seaming ! OOOOh your sock yarn is fabulous. Do tell how one goes about acquiring some? Cheryl did me too! Love the yarn, great dye job there. What a delicate little camisole! I bet it's going to be a joy to knit. Your new camisole will be gorgeous - so feminine. Your felted flowers are really nice too - what a great idea for a gift. That is one bouquet that won't wilt! I had a little chuckle reading "Pick or Throw?" - I knit in the English style as well - I even throw my yarn! Supposedly the easiest method to use for teaching small children - haha! If someone's got a problem with my method, they should pay more attention to their own knitting I say! :-D I've given Continental knitting a go a few times but my left hand is so awkward that I didn't stick with it - my gauge was going to suffer for it. 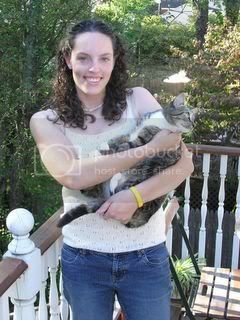 That camisole is gorgeous! That will look terribly cute on you too. I love all the feminine knits that are out and about this summer! I had to love the flowers you felted!! I was looking for free patterns but unfortunately didn't find any... The ones you made are just adorable!!! I would love some Gryffindor yarn -- my two daughters and I started the HP books this summer and we're all loving them. I'd love to knit them socks for christmas. Please let me know how to order the yarn. I would love some Gryffindor yarn too. Where can I buy :)? Pleeaseee. Yes that yarn is wonderful. So I will also ask how can someone acquire some? I'm a Harry Potter fan and I love that striped yarn. I live in Germany and would love to know how to get some. 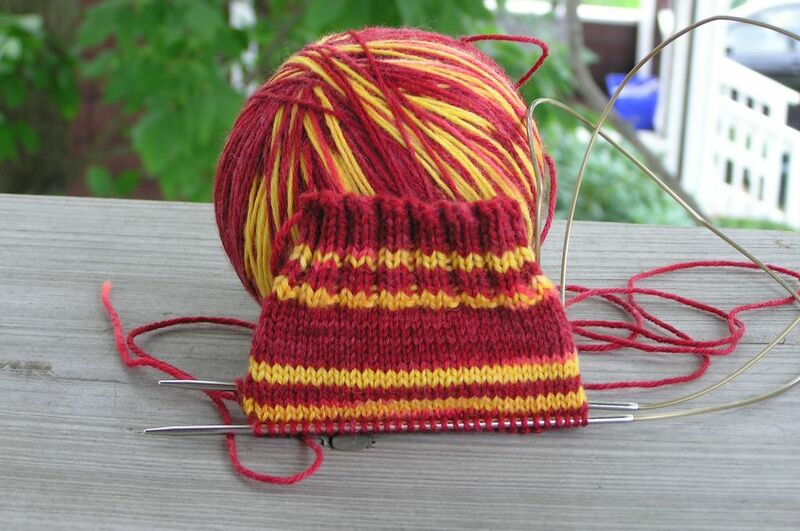 joining the bandwagon...i have to get myself some of your harry potter-gryffindor sock yarn. that's just brilliant. i see on the esty site that you'll be posting more on the 18th/19th... is there a place to preorder? also, will you be making other harry potter house yarns? i'd like to make someone a pair of ravenclaws, but i've never dyed yarn before. Ohhhh.... Must.Have.Some. 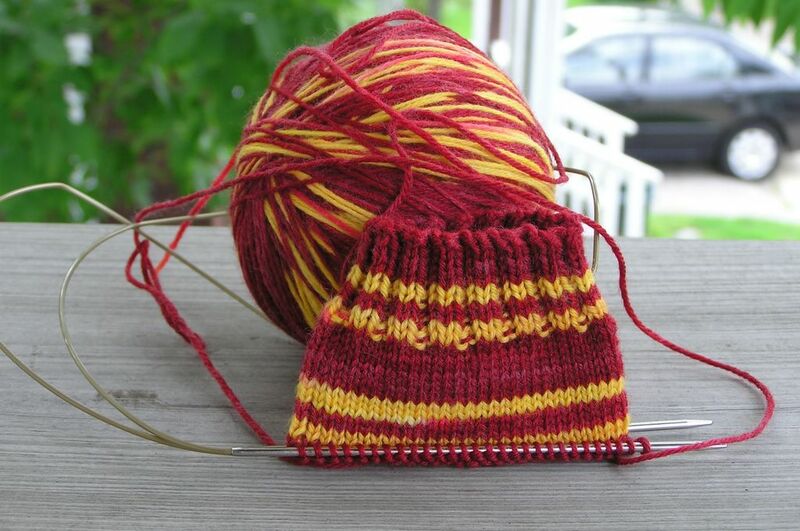 gryffindor sock yarn! I sent you an email through your Etsy shop.... So cute! Lovely job you did, dyeing this yarn -- do you have anymore Gryffindor yarn available to purchase? My sister-in-law would love some. If you had some in worsted weight - all the better -- she wants to make a scarf, rather than socks. Hello! I did a search for Gryffindor yarn and came upon your site. How would one go about purchasing some of your yarn? Thanks so much! simplecountrybumpkin at gmail dot com.